A shot at the stinking passion plant creeper. The twirl of the hairy bract is quite fascinating. The passion flowers or passion vines (Passiflora) are a genus of about 500 species of flowering plants, the namesakes of the family Passifloraceae. They are mostly vines, with some being shrubs, and a few species being herbaceous. For information about the fruit of the passiflora plant, see passionfruit. The monotypic genus Hollrungia seems to be inseparable from Passiflora, but further study is needed. Another view in my WS. Great use of shallow focusing and great contrast between the plant and the red blurred BG. Great details with the hair on the stem clearly visible. Beautiful lighting and above all a very pleasant composition with this spring-like structure. A lovely macro work where you captured the delicate details of the passion flower with superb sharpness and details,lovely lighting and a beauitful contrast colors with BG,well captured and a beauitful macro presentation. Though there is aa certain amount of OE observable on this plant creeper but overall, you nicely managed the shot, Jusni! Great focus and perfect clarity of this creeper against a rust-colored blurry BG. The sharpness and POV are well chosen, and colors are natural. The hairs on the plant are well detailed too. Unusual plant , not akin to the the famous insectivorous pitcher plant for the trumpet-like enclosure leaf where the insect is caught is missing nevertheless an interesting curly never ending stem that makes this plant a little weird-looking i reckon , technically some OE on those specific areas where the light falls other than that the BG makes for a colorful backdrop to the green twister here even makes me me wonder where you actually took the photo , is it one of your home plants Jusni ? Thank you for showing me the different varieties found in Malaysia , well i'll be going to bed a little more learned tonight with this new one , lol! Wow! Simple things made to look beautiful. Very nice composition and good use of the dof to bring out your subject. Good colors and textures. Well done, tfs. 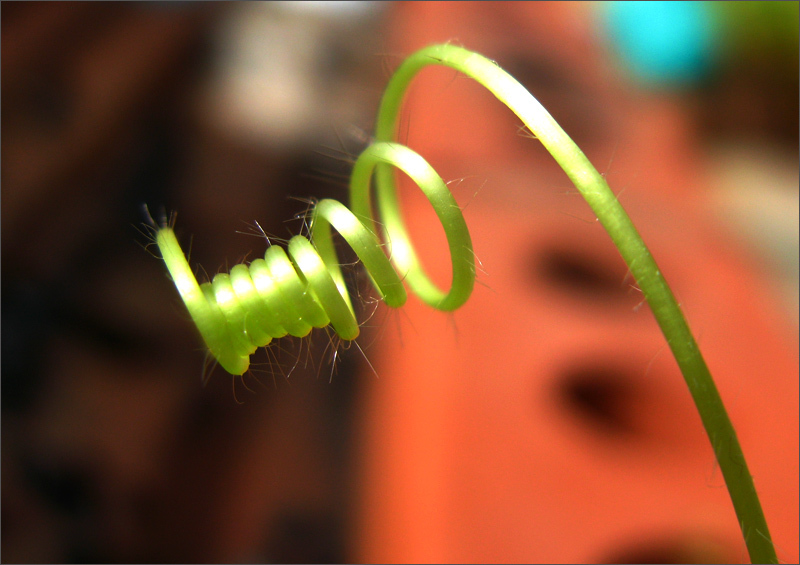 Pretty exciting macro of a plant, an interesting spiral despite a bit of white on the twig with his hair bright. BG good natural colors, beautiful work. Simple and beautiful, only the essential.